Around the time the Pic Tor Promenade was laid out in 1902-3 Matlock Council bought several boats and a boathouse from Mr. Walton. This was their first direct involvement with boating. The Council did not not want to let the boats out for hire themselves, and their idea was to lease the right and the boats and they advertised for tenders. They also converted the old boathouse at the end of the Pic Tor Promenade into a drill hall for the Matlock Volunteers. In 1909 one of the Council's ideas for the development of the Hall Leys was "a boat landing for the resuscitation of boating on the Derwent". Boating was banned for some time after a double fatality near Pic Tor promenade and the boats then in use were scrapped. 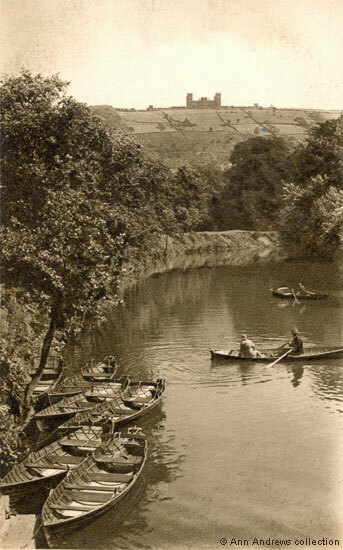 However, in 1929 the Council decided to re-introduce boating as a leisure activity on the River Derwent. A Council sub-committee was given the sum of £50 to spend on the preliminary arrangements. By August they were discussing how to give Matlock one of the finest boating stretches in the Midlands and even contemplated making the river Derwent about three feet deeper. The alteration would increase the navigable stretch of water to about two miles, from Artists' Corner to Darley Meadows. The Council visited Artists' Corner and considered the proposal for the erection of a weir which would raise the level of the river. They also contacted the manager of the colour works about raising their weir by three feet. The photograph above would have been taken from the river bridge connecting the Hall Leys with Old English Road as there was a landing stage on the Hall Leys side of the riverbank where the boats could be hired. The edge of it can just be seen in the bottom right corner, where the bows of two of the rowing boats are moored. The narrow landing stage on the riverbank was reached by descending two sets of steps from the Broad Walk. The boat station looks newly built in the second image, which probably dates from the 1930s. Presumably the man holding onto one of the pleasure boats was a council employee. A few people were watching the boaters, including three tennis players, whilst others are standing on the platform on the water's edge waiting their turn. There are two lifebuoys, one at the bottom of the steps and the other hanging from a tree on the walk. They were used from time to time. The small hut on the Broad Walk has a sign next to it, which would have shown the tariffs. Behind the hut you can see the bandstand and the pavilion, and the shops next to the cinema on Causeway Lane. The third postcard is probably of a marginally later date than the others above. The moored boats now had numbers on the bow which are not on the other pictures. Boats could still be hired in 1942 when there was an unfortunate fatality involving a young Council employee who was taken ill and drowned whilst his friend had gone for help. The final picture is a view of the Derwent from Matlock Bridge. The boat station is just visible under the left hand end of the footbridge that connects the Hall Leys with Derwent Avenue and Dale Road. 2. 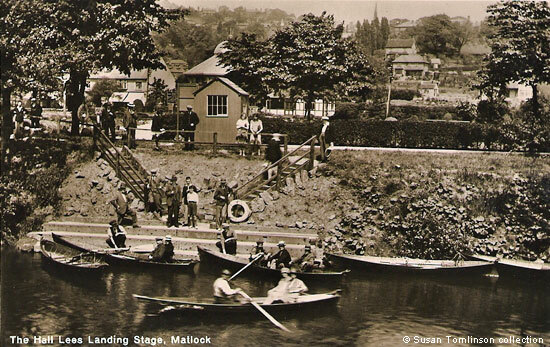 "The Hall Leys Landing Stage, Matlock". No publisher and not posted. Postcard in the collection of, provided by and © Susan Tomlinson. 3. 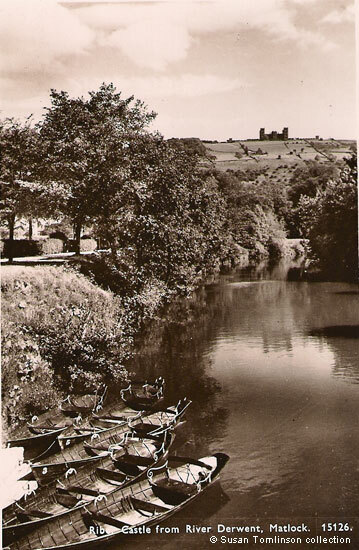 "Riber Castle from River Derwent, Matlock". J Salmon Ltd, Sevenoaks, no. 1526. Not posted. Printed bottom left, but not shown, is "From, With Greetings and Best Wishes". Postcard in the collection of, provided by and © Susan Tomlinson. 4. 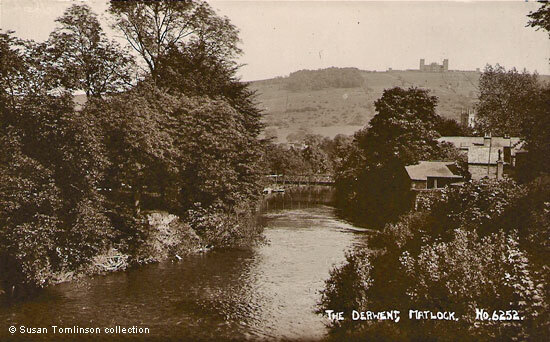 "The Derwent, Matlock". R Sneath Paradise Street Sheffield. No.6252. Postcard in the collection of, provided by and © Susan Tomlinson. Researched, written by and © Ann Andrews. Intended for personal use only. "Manchester Courier and Lancashire General Advertiser", 6 September 1909. Also see: Hawe Lees, Matlock, showing Bandstand and New Pavilion for the Council's other plans. "Derby Daily Telegraph", 16 July 1929. "Derby Daily Telegraph", 20 August 1929. "Derby Daily Telegraph", 21 August 1929. "Derby Daily Telegraph", 17 July 1942. Matlock River Tragedy.